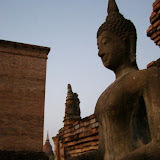 After a harrowing bus ride moving at what seemed like warp speed, we arrived late last night in Chiang Mai. Wow. Already this city seems really great. We went to the night markket and bargained for things we didn’t even want (Although I may go back and get some lighter weight travel pants; most of mine are too heavy) I’m not entirely sure, but I think one of the reasons I may have fallen in love with Chiang Mai on the spot is that I am not sweating profusely. It is blissfully cool here. I have developed a bit of a cold that I am hoping to get over before we head out on our next adventrue: Taking a slow boat down the Mekong river to Luang Probang in Laos. Amazing pictures…Why are some of the various temples/holy places conical, and others more rounded? Do the shapes have different meanings? Are they a function of the use? ?